Code Compliance Commences Demolition of Hazardous Structures! December 9: After three months of notices and hearings and missed deadlines, Kern County Code Compliance broke ground on a series of demolitions, starting with these hazardous structures on L Street and M Street, which have been abandoned for over 15 years! “I can’t believe it’s finally coming down” exclaimed a neighbor, happy to see this building go. 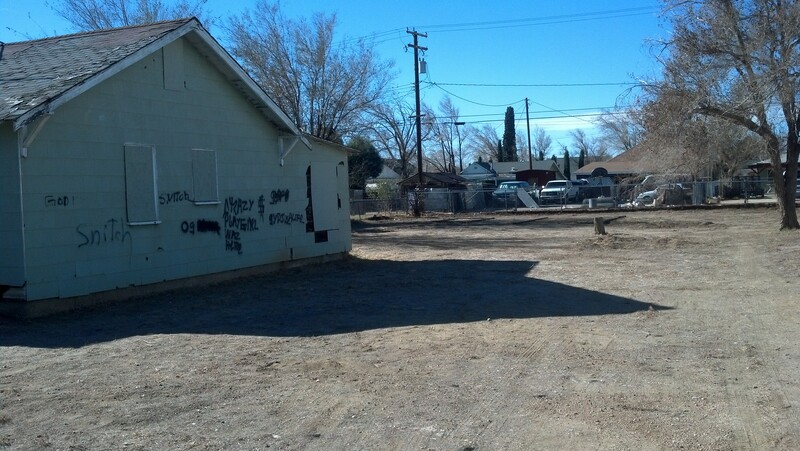 “Maybe now we can start to clean up this block.” These abandoned structures tend to be one of the biggest sources of drugs and crime in Mojave, and can be extremely dangerous for children and neighbors. This house on the 15800 block of L Street (pictured above) is the first of four structures to be demolished in the next several weeks, including another house on the 15700 block of L Street and the fallen-down garage removed from the 15900 block of M Street (pictured below). The Mojave Foundation works closely with Kern County Code Compliance officials to prioritize buildings for cleaning and demolition, and we applaud the recent flurry of activity. We encourage property owners to sell their vacant hazardous homes before Code Compliance gets involved. It costs on average $15,000 for the county to demolish a house in Mojave – mostly due to “prevailing wage” mandates and administrative time. If the property owner decides to walk away from the property, the fines and taxes get assigned to the property in the form a lien, which then discourages future development. The Mojave Foundation would much prefer to work with property owners to resolve safety issues quicker and cheaper than what the county can do it for, and to transition the property to responsible owners. Using local volunteers and contractors property owners can expect to pay about $5,000 on average to demolish a structure, and they can usually make a lot more than that when they sell the property to a local buyer. 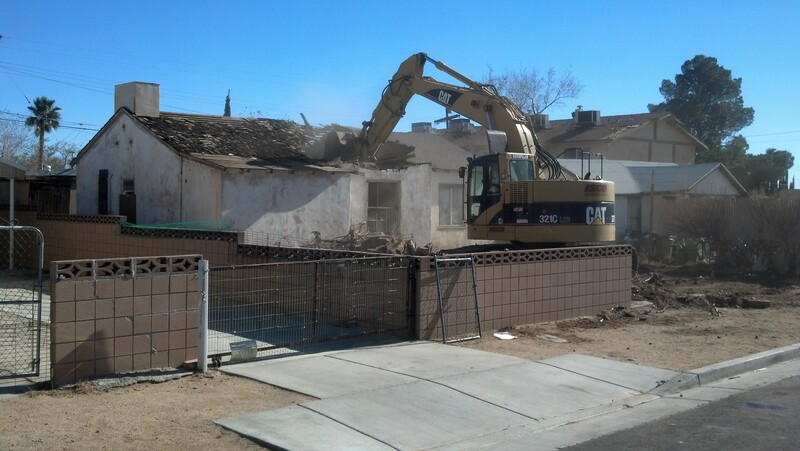 This demolition and transition is a critical part of our strategy to restore the health and vibrance of this community. This entry was posted in Beautification, Cleaning up, Kern County Code Compliance, Mojave CA, Quality housing, Security on December 9, 2013 by mojavefoundation.